In India the government always believes in the JUST IN TIME concept. They just manage to do the work at the last minute and just cover up things. Look at this case of THIRD gate where for about 10 mtrs there is NO road at all while going towards Udyambag. As a stream of VVIPs are due to visit town from today evening today morning the Corporation just remembered that this particular road is bad shape and even when it is under the NHAI who said they dont have money took up the patch work from Third gate to Udyambag. Tomorrow Union Fianance minister, Governor of Karnataka, CM Sadanandgowda and many ministers will take part in two different programs at VTU and Foundry cluster. 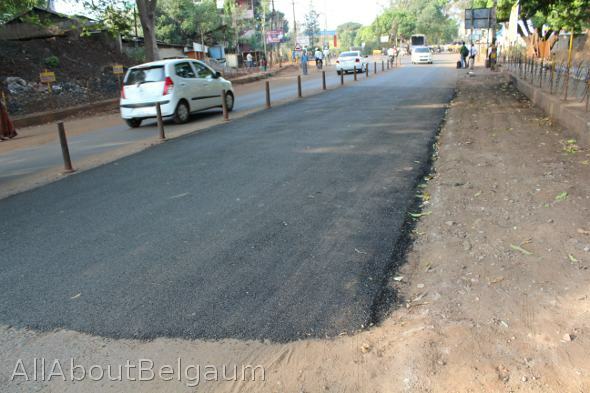 The Belgaum chambers of commerce and industry came on the roads and stopped the patch work being under taken and said that let the VVIPs travel on the bad roads. For over TWO years the residents and the Chambers have been demanding the repair of the said road but no one heeded to the demands. But today as the VVIPs are coming to town now the corporation will work day and night and repair the roads. Why cant these VVIPs visit each town on a monthly basis to different parts of the city, so that we can have good roads atleast? Let’s pray & hope that the VVIP’s visit are frequent so that atleast the our CITY gets better roads….but hope that roads will last long. I heard that Mr.CM is coming here for a private function (Wedding) But how could he directly come on govt. expenses may so he must have planned it today. Well we never know. Lets Hope something good comes out of it as there are some proposals going to be given to him for Belgaum and North Karnataka. Do you have any plans in your mind for the Belgaum’s developments or empty as usual.You peoples are busy in conducting events which are good for nothing. As all VIP’s and central ministers are coming to our city and we are expecting from you to demand for the city’s development.Till now no politicians shown any interest for Belgaum’s developments. Entire karnataka calling Belgaum as second capital of the state after BJP comes to the power nothing happened in city which it deserved. Suvarnasauda is JDS+BJP combined govt idea. That time they have decided to declare Belgaum as second capital but still it is not done. Warranty and guarantee of such repair patch work is a grand total of two days. Now they will also start preventing belgaum people from using the roads on 2 days. Under the name of security. Baricades are already in place. Don’t bother coming out to your house.